Loctek FP1 is a hot new release compact stepper, twister and swivel elliptical machine for a great cardio workout in the comfort of your home. 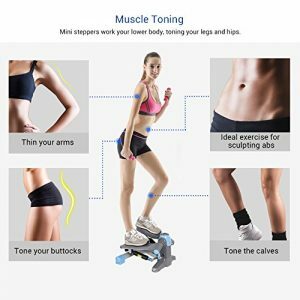 It is designed to help you tone your calves, legs and hips and your buttocks and sculpt your abs. It is suitable for people of all ages and varying fitness levels. FP1 is a solid and sturdy step machine with a durable frame and build along with a great quality damper to withstand many years of daily use. There is even a small digital display panel that tells you the time, calories, rpm, step count and with the scan option, it will show each of them, one after the other. And there is a single button to change these indicators. Grey and blue Loctek FP1 weighs about 15 pounds, has the user weight capacity of 220 pounds. It measures 16 x 17 x 10.6 inches with 12-inch long pedals and the height of the steps from the ground is between 4 and 11 inches. It will save you on space in your living area due to its compact design and is easy to relocate and store in a convenient place. Unlike most fitness machines this unit will be shipped assembled and you do not need to do any extra work except for putting in the batteries for the display panel. It is pretty much ready to use straight out of the box and the operation is straightforward. You need to use it in a standing position, and it won’t work in a seated position. If you want to exercise while sitting you need to consider alternative units with pedals. It is nice to have this handy at home and you can burn some calories and tone your legs whenever you want. It will not beat going to the gym regularly but is certainly heaps better than not doing anything at all. And it is always wise to combine it with a healthy eating plan, to get results much faster too. There is no way to change the resistance levels as the resistance is pre-set and seems to be fairly challenging. It is not a simple up and down movement but it twists your lower back while you move the pedals up and down. You can think about the part of your legs or buttocks you want to work on and focus on that while you’re stepping. You can think about the part of your legs or buttocks you want to work on and focus on that while you’re stepping. The pedals are not completely flat, but slant a little outward at the top and inward at the bottom- you will feel an inward slant at each step. It is not really quiet either and in a quiet office or room, it may disturb others in the room. You will want to wear comfy gym shoes as it may not be safe with bare feet. Loctek FP1 is a low cost and great value product and comes with a one year warranty by the manufacturer.